AIA Huron Valley - Just Build it! - Volunteer Day! Just Build it! - Volunteer Day! Please register if you are interested in helping with one or more of the available time slots. First come first served! On October 17th the Washtenaw Contractors Association will be hosting the 21st "JUST BUILD IT!" Construction Career Expo. This is the longest running and most comprehensive construction career exploration in Michigan. 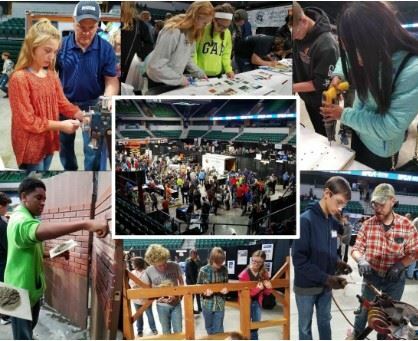 It provides students in grades 8-12 and their counselors and teachers with hands on activities with the skilled trade apprenticeship programs; demonstrations by industry professionals such as architects and engineers; and exhibits by constructions firms, educational institutions and industry organizations. Since the Expo was introduced, over 31,718 students from 173 schools in 12 counties in southeast and central Michigan have participated.